The new Robocop arrives as several things at once: a remake, a reboot, re-imagining, a throwback, a systems upgrade, but, overall, a success. Walking in the heavy footsteps of Paul Verhoven's 1987 genre-defining original, highly-regarded for its ultraviolence and its biting social commentary, director Jose Padilla's entertaining 2014 Robocop tells a familiar tale: Detroit police detective Alex Murphy (Joel Kinnaman) is mortally wounded by criminals and is transformed into a crime fighting cyborg by an evil multinational corporation. While sporting a PG-13 rating and holding back on the blood and gore that so delighted the previous generation, Robocop (2014) remains plenty violent -- an ED 209 drone opening fire on an Iranian boy essentially opens the picture. Robocop also heroically stacks the deck in geek cred: Surrounding Kinnaman (from The Killing) as the new Robocop are Batman (Michael Keaton), Nick Fury (Samuel L. Jackson), Commissioner Gordon (Gary Oldman), Rorschach (Jackie Earle Haley), one of the girls from Sucker Punch (Abie Cornish), The Sorcerer's Apprentice (Jay Baruchel), and Omar from The Wire (Michael K. Williams). The hordes at Comic Con would bow down to this cast if they assembled at Hall H.
Keaton is the odious head of Omnicorp, which earns billions manufacturing robots and drones to the Pentagon. Omnicorp robots have replaced human soldiers as the primary weapons of war overseas. Politics prevent Keaton from deploying his robots on United States soil, despite the mad dog urging of television carnival barker Sam Jackson. Robocop is ultimately just a pawn in a political game for Keaton to get a bill banning his robots in the US repealed by the Senate. When Kinnaman's Alex Murphy is nearly killed by criminals he's hunting in Detroit, Keaton sees his opening to put a man in a machine as a PR stunt to woo public support to his robots being on every American street corner. Thanks to the cybernetics of Gary Oldman (a much more kindly creator to Robocop than Miguel Ferrar was in 1987), Kinnaman survives and is transformed into Robocop. Unlike in 1987, where Peter Weller's Alex Murphy turns his back on his previous life and concentrates on being a police officer, Kinnaman's Murphy holds onto his humanity much tighter, trying his best to reunite with his hot loving wife, Cornish, and their traumatized son. Kinnaman is a more human Robocop, at least until Oldman is forced to override his humanity and let the machine take over. This launches Robocop's one cyborg war on crime as he zips around Detroit on his Robocycle and solves the mystery of his own murder. In battle, Murphy's programming essentially turns him into the greatest Call of Duty player there ever was. The story of Robocop has always been about Robocop biting the hand that feeds him. Like in the original, Robocop is eventually pitted against his very creators, but mostly because they tried to kill him and threatened his family. In every incarnation of Robocop, Omnicorp (OCP in the original) is a heartless conglomerate using Robocop to further its own nefarious ends. 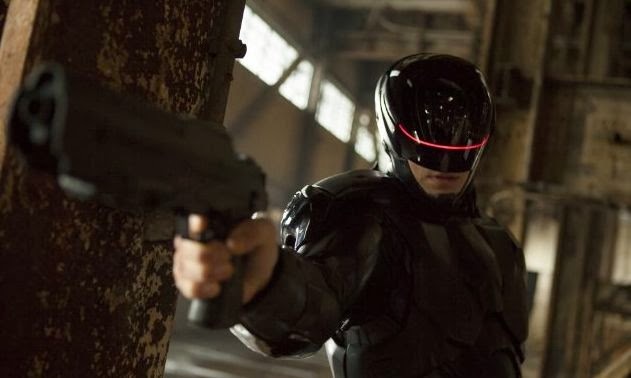 Though Keaton's Omnicorp is more profit-driven and less outright diabolical than old school OCP; Keaton nevertheless isn't above lying right to Robocop's wife's face and shooting her if he has to. Keaton certainly has no issue terminating Murphy when Robocop ceases to be useful to Omnicorp's bottom line. Robocop battles ED 209 drones once more, but despite the improved CGI, the battle is merely more manic and less memorable than in 1987. The Detroit of the new Robocop isn't depicted as the apocalyptic urban wasteland Verhoven had nasty fun with in the original, and the criminals Robocop hunts aren't nearly as venal as Clarence Boddicker, the merciless heavy Kurtwood Smith portrayed in 1987. On the other hand, the new Robocop, painted in "tactical" black, can do things Weller's human tank could never do, like run and leap great distances. We also spend copious amounts of time seeing Alex Murphy without his Robocop shell; all that's left of the man is a severed head like in Futurama, his right hand, and his lungs attached in bags. (It's never addressed in the movie why Oldman saw fit to let Murphy keep his right hand.) Perhaps the clearest reflection of our times is that the new Robocop, which cost billions, was outsourced by Omnicorp. Somewhere in his shell must be the stamp "Made in China." Arrow 2x14 - "Time of Death"
Arrow 2x13 - "Heir to the Demon"